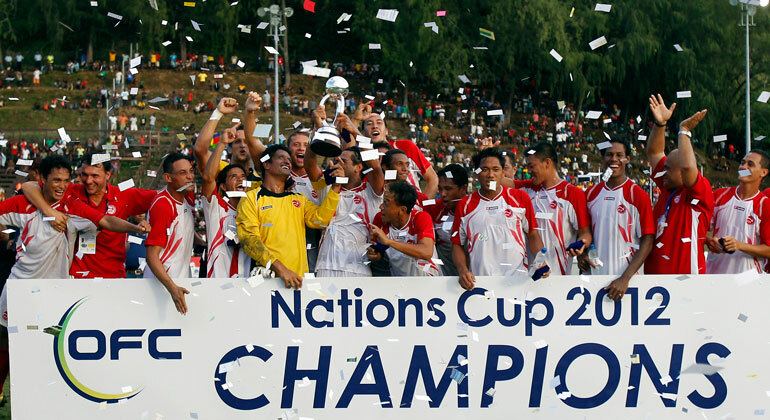 Tahiti surprised the football world four years ago by becoming the first nation outside New Zealand – and former OFC member Australia – to win Oceania’s premier international football tournament. Only a third of that championship winning squad from 2012 is returning to defend their crown, but several players of the new generation come into the tournament with valuable international experience, as members of the U-17 side which narrowly failed to reach the FIFA U-17 World Cup in 2015. Tahiti coach Ludovic Graugnard insists his side won’t be complacent when they face the preliminary qualifying tournament winners. Meanwhile, the Samoans will enter their second OFC Nation Cup campaign with an aim to improve on their debut performance four years ago. During the 2012 edition of the tournament Samoa suffered three heavy defeats, and their best result was a 5-0 loss to Vanuatu. Since then they have appointed a new head coach Scott Easthope, who believes the current side will go into the tournament with a goal to prove a point. Host nation Papua New Guinea will face a tough challenge against New Caledonia on Saturday evening. Papua New Guinea finished third at last year’s Pacific Games on home soil, which boasted the hopes of the country’s football fans. With expectations growing the pressure is also increasing on the national side to go out and challenge for the title. With Denmark’s Flemming Serritslev at the helm, the team is in good hands. The experienced former Danish international, who based his squad on players from the country’s two champion clubs in the National Soccer League — Hekari United and Lae City Dwellers, says his side must make the most of the home support. Meanwhile, New Caledonia will go into the tournament with high expectations. In 2012 they were just one match away from securing an historic title, before going down 1-0 to francophone rivals Tahiti. A several key members of that squad have since retired, forcing coach Thierry Sardo to rebuild the national team. Despite the rebuilding phase, Sardo has included four France-based veterans in his squad with Jean-Phillipe Saiko, Judicael Ixoee, César Zeoula and Georges Gope-Fenepej. New Caledonia have been a consistent performer at regional level, and following two second-place finishes in a row at the Nations Cup the coach believes the current Les Cagous can go one better this time around. The players: A surviving veteran of the 2012 campaign Alvin Tehau is a hard-working but skillful midfielder, who brings a lot of experience and calmness to the squad. He will be well complemented by 23-year old Teaonui Tehau, the team’s diminutive, fast and technical playmaker. Squad list: 1. Mikael ROCHE (GK), 2. Taumihau TIATIA, 4. Ricky AITAMAI, 5. Rainui AROITA, 6. Henri CAROINE, 7. Temarii TINORUA, 8. Tauatua LUCAS, 9. Tauhiti KECK, 10. Teaonui TEHAU, 11. Jay WARREN, 12. Mauarii TEHINA, 13. Steevy CHONG HUE, 14. Matatia PAAMA, 15. HEIMANO BOUREBARE, 16. Bruno TETUANUI (GK), 17. Tamatoa TETAUIRA, 18. Tefai FAEHAU, 19. Vincent SIMON, 20, Alvin TEHAU, 21. Fred TISSO, 22. Nicolas VALLAR. The players: The leadership of veteran striker Desmond Faaiuaso will be vital to his side’s fortunes. The vital statistics: During their Nations Cup debut at the Solomons four years ago, the Samoans have only managed to score once in three matches. Even more worryingly they shipped 24 goals. Scott Easthope’s men will need to shoe a lot of improvement at both ends of the pitch if they want to make an impact. The players: Young striker Tommy Semmy had a fantastic OFC Champions League tournament with Hekari United last month, impressing with his speed, physical presence and hunger for goals. He will be well supported by experienced campaigners David Muta and Raymond Gunemba. The vital statistics: The PNG squad is mainly based on two local National Soccer league sides. There are 12 players from Hekari United and six more from their rival club Lae City Dwellers. The players: A key member of New Caledonia’s 2012 OFC Nations Cup squad, Laval starter Cesar Zeoula will bring invaluable experience to the national team. The other three French based players Jean-Phillipe Saiko, Judicael Ixoee, Georges Gope-Fenepej can also make a significant impact. The vital statistics: Thierry Sardo’s 22-man squad is made of players from 15 different clubs. New Caledonia’s chances will depend greatly on how good the understanding is between them.